Poll: Should Sinn Féin MPs from the North be allowed to speak in the Dáil? The calls come as the DUP look set to enter a coalition with the Tories. 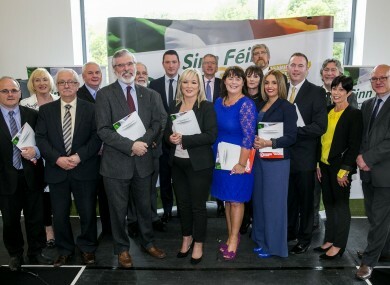 SINN FÉIN CANDIDATES stand in the Westminster elections but do not take their seats as they would have to swear an oath of allegiance to the Queen. Speaking in the Seanad yesterday, Senator Niall Ó Donnghaile called on the incoming Taoiseach Leo Varadkar and Fianna Fáil leader Mícheál Martin to support extending “the long-standing promise, that MPs from the north would have speaking rights in the Oireachtas”. The request is more pertinent now as it would appear that the Conservative Party and the DUP are to form a coalition, something which former UK PM John Major has said could destabilise the Good Friday Agreement. Sinn Féin’s argument is that they are elected as MPs by people living in Ireland. Therefore, they should have the right to address the Dáil. We want to know: Should Sinn Féin MPs from the North be allowed to speak in the Dáil? Email “Poll: Should Sinn Féin MPs from the North be allowed to speak in the Dáil?”. Feedback on “Poll: Should Sinn Féin MPs from the North be allowed to speak in the Dáil?”.